Today, producing HD film、3D animation had been a trend in industry. Follow up with the video editors have more requirements about applications、 the artistic creators need higher speed of processor and larger memory to satisfy high speed calculation. Relatively, the connection of processor and HBA must upgrade synchronously. 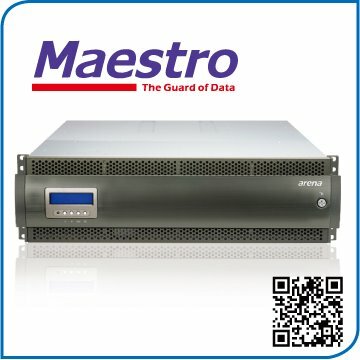 Enterprise-class storage with high performance and availability makes the Maestro series capable of satisfying the most demanding business and technical applications as well as virtualized environments. The Janus series is a cost-effective solution designed for SMB and most feasible for Video Surveillanceapplication; which looking for reliable technology, solid functionality and large capacity. The Maestro series is designed for high performance with Intel Xeon dual core CPU and DDR III memory to take full advantage of modern Hardware and Software architecture. These storage systems support latest connectivity interfaces including 8Gb FC to hosts and 6Gb SAS disk interface, perfectly meet the requirements of mission-critical operations.